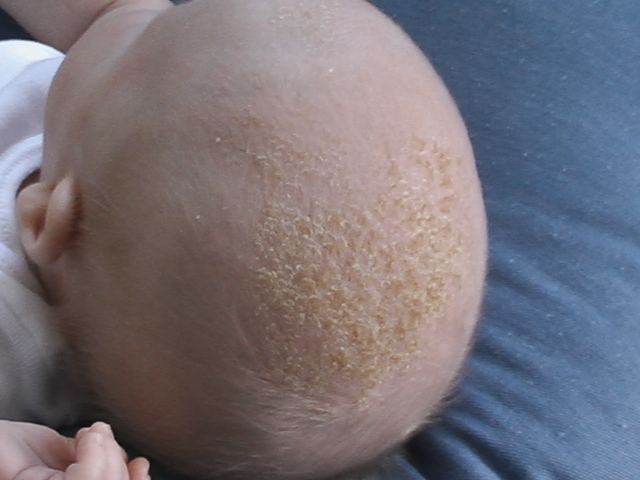 Cradle cap is a common scalp problem in newborns. It is characterized by yellow, oily scales that flake off the baby's head. It may appear on the baby's scalp, forehead, eyelids, eyebrows and around the ears. It can be gross to deal with but it is not itchy for the baby and not contagious. It's just another weird thing about newborns that no one warns you about. Cradle cap is a form of eczema. The precise cause of cradle cap is not entirely known, but it is believed to come about due to a combination of factors including hormones that are passed between mother and baby, overactive sebaceous glands and the yeast Pityrosporum ovale. Typically cradle cap can be resolved with natural home treatments. An hour or two before giving baby a bath, rub coconut oil, olive oil or mineral oil into the baby's scalp. Coconut oil is an excellent option because of its natural yeast fighting properties. Let the oil soak into baby's scalp for an hour or two, then gently scrub with a soft bristled brush to remove the scales. Some moms also like to use a comb or their fingernails to gently scrape away some of the scales. Avoid over-scrubbing which could irritate baby's sensitive skin. After scrubbing, give the baby a bath with a gentle shampoo to rinse away the oil and scales. Repeat this process as needed. Typically, cradle cap will resolve itself within baby's first year. In some cases a pediatrician may prescribe medication or recommend using dandruff shampoo, as cradle cap could develop into a yeast infection. Do not use without the direction of your pediatrician.